Hercules Fence is proud to be one of the top dealers in not only Manassas, Virginia, but also the entire country for Aluminum Fence Installation. Click Here to view just a few of our previous projects. Our aluminum fences look great with any style home, complementing beautiful landscaping without limiting your picturesque view. That’s what we like to call a win-win. Click Here for a FREE quote today! A new fence will give your home an instant boost in that department. Period. End of story. Aluminum is available in many different grades and styles with 5/8,” ¾,” and 1″ pickets. Standard colors are black, white, bronze and hunter green. Aluminum withstands the elements better than welded steel or wood. Aluminum will not rust. Its unique powder coating process ensures that your aluminum fence will look great for many years to come. In fact, the powder coating comes with a limited lifetime warranty. It is estimated that aluminum will take more than 10,000 years to disintegrate. Aluminum fences are much more affordable than you would think. In fact, aluminum fences are much less than traditional wrought iron fences. Unlike wrought iron or wood fences, aluminum fences do not need to be painted annually. You want to added security. After all, there are roughly 900 property crimes in Manassas annually, including 111 burglaries, 741 thefts, and 48 auto thefts. Northern Virginia homeowners have a 1 in 44 chance of becoming a victim of property crime. If you want to improve the security of your property, you want an aluminum fence. Aluminum fencing with spear-topped pickets is incredibly difficult to breach. For more than 50 years, Hercules Fence has been providing exceptional fence services to the people of Manassas and the surrounding area. 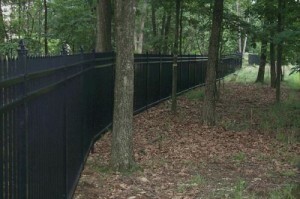 We pride ourselves in installing high quality fences at affordable prices. We are Virginia’s largest fence company, giving us the ability to buy the product you want at a price you’ll love, a price that will afford you value to complement our quality. Why would you trust anyone else with your Aluminum Fence Installation? Please contact Hercules Fence of Manassas, Virginia by calling (703) 551-2609 or visiting our website. You can also follow Hercules Fence on Facebook, Twitter, Google+ and YouTube! This entry was posted on Friday, October 17th, 2014 at 1:48 pm. Both comments and pings are currently closed.